3M WORKTUNES HEADPHONES Connect Wireless Hearing Protector with Bluetooth Technology. Features - Audio Assist/Voice Assist, Bluetooth Wireless Technology. Product Type - Ear Muff. Integrated microphone lets you make and take phone calls without removing the ear protection. 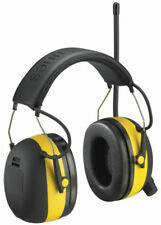 For Sale: 3M Peltor MRX21A2WS6-NA WS Alert XP Headset. Fits iPod 5th gen Video 30GB. Faceplate and back cover are with tough protector film to protect, we also give a set of opening tools. 2: We don't provide instructions, make sure your could install the part correctly, if you are not sure of your skills, we suggest you find a professional to help. Mfp#: MT13H220A. Used 3M PELTOR Protac III Ear Headset Hearing Protection, Slim, Black. This pair works well and has only normal wear. See photos. System includes two in-ear noise isolating tri-flange ear tip options for a stable, comfortable fit and isolation of audio input. Audio muting option is capable of shutting off sound with just a touch of a button. 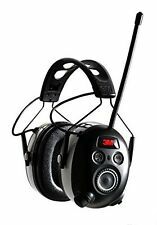 Ear muffs for comfortable protection from high noise levels. Replaceable cushions and inserts. 3M MODEL 90559. Folding Ear Muffs. Oversized ear cushions for superior comfort. Noise reduction = 23-Decibel. Auto power off, the headset will turn off after 4 hrs. Monitor can rotate to portrait or landscape. with just a touch. The economical ergonomic LCD. 100 mm x 100 mm VESA-D monitor bolt hole patterns. monitor solution. Features Easy Adjust Technology Yes. 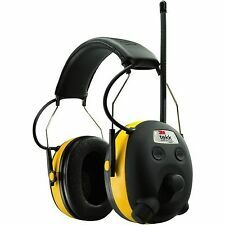 3M WorkTunes Hearing Protector MP3 AM/FM Tuner Digital Radio Headphone . Condition is New. Shipped with USPS Priority Mail (1 to 3 business days). Built-in comfort features like plush ear cushions and a padded headband help keep you comfortable while on the job. Plus, Voice Assist Technology lets you know which radio station you're on without having to remove the headset. Soft, Comfortable Ear Cushions. Helpful Links. Auto power off, the headset will turn off after 4 hrs of non-use to save battery. Low-battery warning to inform you when to change batteries. Check Our Feed Back ! No exception. We make no representations or warranties. 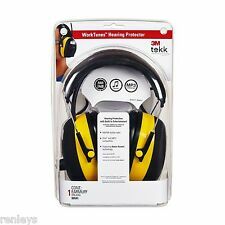 Your are purchasing:(2)WORKTUNES HEARING PROTECTOR HEADPHONES. 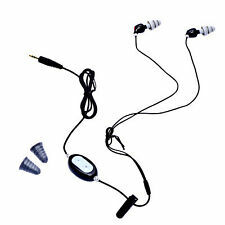 This sale is for: (2) WORKTUNES HEARING PROTECTORS WITH VOICE ASSIST, AM/FM RADIO, AND IPOD COMPATIBILITY. Voice assist. Compatible with ipod or MP3. Wireless Blutooth Headphones. Used but in great condition. 3M WorkTunes Wireless Hearing Protector . Condition is Used. Shipped with USPS Priority Mail. DOES NOT HAVE CHARGER OR CORD. ONLY HEADPHONES. HD598SR Headphones. See all photos for physical condition. The 3.5mm stereo audio jack is compatible with MP3 players. Designed for comfort with a triflange reusable ear plug. Includes an easy-access volume control and belt clip. Electronic Earplugs, Ear Muff Style In-Ear, Noise Reduction Rating NRR 26dB, Series E-A-Rbud, Ear Plug Color Gray, Battery Type (1) AA, Includes one pair of the UltraFit(TM) Communication Eartips (NRR 20dB) and one pair of the Skull Screws(TM) Communication Eartips (NRR 29dB), 1 Pair. Digital tuner can scan and save up to 50 stations. Hearing protector with 24dB NRR. remove Work Tunes from your ears. HIGH QUALITY. DBI-Sala™ Confined-Space Equipment Tripods feature rubber skid pads on base and adjustable locking legs with safety chain. 350-lb. workload cap. Carrying bags are made of heavy nylon. Rescue/Retrieval Equipment Confined Space Tripod, Material Aluminum, Height Range 84 to 108 In., Base Radius Range 65 In. to 99 In., Color Silver, Finish Anodized Aluminum, For Use With Winch Or SRL And Full Body Harness In A Confined Space Application, Max. Working Load 350 lb., Standards ANSI Z359.1 and OSHA, Includes Safety Chain, Fitted Rubber Safety Shoes, Head Mount Pulley System And Mounting Bracket For Either A Winch or SRL. Your are purchasing:(1)WORKTUNES HEARING PROTECTOR HEADPHONES. This sale is for: (1) WORKTUNES HEARING PROTECTOR WITH VOICE ASSIST, AM/FM RADIO, AND IPOD COMPATIBILITY. Voice assist. Compatible with ipod or MP3.